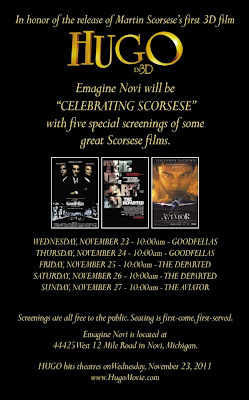 In honor of Hugo's release, Emagine Novi is doing free screenings of Martin Scorsese movies! Today and yesterday was Goodfellas, and you can see The Departed (2006) on Friday and Saturday, and The Aviator (2004) on Sunday. All screenings are at 10am and are first-come first-serve for seating, so I would recommend getting there early. Both films are great with fantastic casts (I've seen both), and it's always nice to see a FREE movie! Emagine is located at 44425 W. 12 Mile Road in Novi.